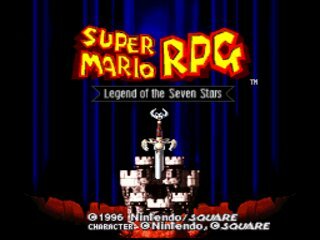 Released in March 1996, Mario's first RPG starts out like most other Mario games: Mario goes to rescue the kidnapped Princess. After a short confrontation with Bowser though, a sword comes crashing into Bowser's keep and sets the three of them flying in different directions. Mario travels around the world, teams up with Bowser and the Princess and others in a quest to restore the 'Star Road' where wishes are granted. Note: This run has a reset to manipulate RNG. I will explain later. I've been running this game for a long time and I got really decent run finally. There are still some mistakes and bad luck but it's really good overall. Mario: Attack at Lv. 6, 9, 12 and 15. Otherwise Special. Mallow: Special at 3, Attack at 4 and 5, Otherwise HP. Geno: HP at 7 and 8, Otherwise Attack. Bowser: All attack until Boomer then give HP. Peach: All special except 16, give HP at 16. The more using Jump move in fight, The more stronger it becomes. This jump power grinding is necessary and it saves time in many battles. +1 power per 2 Jump usage if anyone doesn't know. Only 2 Terrapins punches here, which is really good. Using save skips Toad's tutorial. Not much to say here. I need 12 FP before 1st Belome. This flower doesn't cost time as much as other flowers. He uses Valor Up (2x defence) after you kill either of him so you will take more time if you kill 1 as soon as possible. 2 Hammer Time here isn't good sadly. I didn't get platform coins because another coins will spawn and it takes seconds, I don't need them. I'm getting many items to buy bombs at seaside town. I obtained KeroKeroCola here. I killed 17 k-9s but 10 is minimal amount you need. But in case I get bad luck later, I took safer. Also, I didn't try k-9 jump, which you can hit the flower chest when jump on him with minimal time loss. I was inconsistent at this trick. - He throws Bomb by 1/3 chance and it's unblockable. - He'll use Weird Mushroom (recovers 60 HP) when his hp is below 100. 1 Bomb but no one didn't die, it's good. It will result to skip boss entirely and to proceed game normally. Boss fight takes 4 minutes at least. - He uses Flame (1/3) or Flame Wall (2/3) in every odd turns, uses Normal attack, Carni-Kiss or Scream (1/3 for each) in every even turns. He didn't kill mario in 2nd turn, not bad. I needed coins and Jump power here. I got a flower from same room as Pandorite. (You can cut this flower if you get K-9 jump flower and it's 4 seconds faster). Killed 8 rats with star. 7 is fine if you killed 12+ K-9s in Bandit's Way. I had boo encount by mistake, it cost 16 seconds. - He starts using S'crow Funk when his HP is below 300. - He eats mallow when he isn't scarecrow'd or slept in every 3 turns. He spits out when damaged twice. - He's weak to Thunder. He put Sleep Sause on Mario in 2nd turns and he kept doing no physical attack, bad fight. Get 60 coins exactly to cut one text plus to get 5 frog coins. Get 2 big coins (20 coins worth). If you missed, get small coins from chest(s). Enter shop through chimney and get flower. Select 2nd option in inn conversation. It's faster than 1st option. Get 7 Frog Coins, 2 KeroKeroColas and Red Essense. I need Exp. Booster for 1st Seaside Town visit. A increments 4, Y does 2 and B,X do 0. If Switch Value (SV) is less than 6 -> lock X, SV is less than 16 -> lock Y, otherwise lock A.
SV is reset in each 2 turns. Identical fight, best bowyer fight I've ever seen. - He throws bomb by 2/3 chance when his HP is above 400, He starts using Chomp instead of bomb when his HP is below 400. - He drops Flower Box by 25% chance. I could use Energizer since I freebie'd it in Bowyer, Croco didn't kill anyone and he dropped the Box. Extremely good. I killed 6 Bob-ombs and 1 Flame ball. Flame guy won't appear sometimes and you may be going to miss level 5 mario if you didn't kill enough enemies from 2 previous stars. Thanks to Flower Box, I can skip 150 coins chest and secret Booster Pass room. But I collected 130 coins out of 150 for buying extra 1 Ice bomb. - He summons Microbomb in 2nd turn. - He summons Bob-omb when his HP is below 800, summons Mezzo bomb when below 400. - He uses Sandstorm by 1/6 chance. Minecart is ok run in spite of 1 crash. Get 1 Frog Coin and Rock Candy. Get 9 Frog Coins, 1 Flower Tab and Goody Bag. I skipped switch as I said in Moliville part. Do not fail curtain minigame and automatically receive Amulet. - Knife Guy is weak to fire. - They pair up in every 3 turns, break pair when they are attacked 5 times. - They drop Flower Jar by 100% chance. Terrorize accuracy is 85%. If it misses either or both, it's huge time loss. Mario on Echofinder is bad too. I didn't get neither, good. - Bundt moves when his HP is below 200 and 0. - Bundt casts Sandstorm by 2/3 chance. Fear is really bad status. I took some times due to that bad Sandstorm at the end but not bad overall. ・Mushroom's Kingdom It's about 3 seconds faster than getting it right after Mack. I gave one Toad NPC back his wallet for Flower Tab and 1 Frog coins. It's fastest way to maintain frog coin number with skipping Booster Pass revisit. Re-enter castle can cut waiting peach lands, which saves about 1.2 seconds. Give Frogfucius Cricket Pie and talk him again. I didn't go Booster Pass after this because I got Flower Box from Croco. Buy Exp. Booster before shopping. I was going to buy 9 Ice but I sold 2 Flower Boxs at once and lost about 50 seconds. So I had to buy Fire Bomb instead Ice but it's not huge time loss. I used it for Peach Shocker. This is really useful in some battles. - They all are weak to fire. - Tentacle will throw you to off screen and make your ally fear when you can't past a phase in 3 turns. I just Fire Bomb freevbie here. 1 was ok.
Get KeroKeroCola and Safety Ring. Ring is one of broken accessory, which prevents all bad status, elemental spell damage and mortal brow. Also, it gives +5 speed, defence and magic defence. - He is weak to fire and thunder. - He will run away when just one survive. Just throw 2 Fire Bombs and got no freebie. classic. - Johnny uses Get Tough when his HP is below 400. - He will 1vs1 mario when his turn comes and these following conditions are achieved. 2. No Bandana Blues are alive. 3. Johnny used Get Tough. I was lucky I had extra Fire Bomb to kill those Bandana Blues. If I couldn't kill Johnny with Super Jump, EXP route will be broken and it's way slower. I'm glad I got 1st try 100. - He is weak to thunder. - He always uses Water Blast in 1st turn and right after he releases Mirage Attack. 2nd Water Blast is bad but I could kill him befofe Mirage Attack and got 1 Ice Bomb freebie. It's not bad. Swap Peach & Geno accessories. I jumped wrong direction in bee's room, that's unfortunate. - He's weak to ice. - He does Vigor Up! (x1.5 attack) as magic counter. 1/4 Ice Bomb freebie, average. No need death abuse anymore. Death abuse is the EXP grind trick. When you die at battle, you'll be sent back to final save. It resets everything but EXP so you can save right before star and use/die to farm EXP as long as you want. This route can cut it because of getting Exp. booster early and it saves much time. Star section went well as I expected. - He won't attack until he creates 2 clones. - Clones can be killed by one shot with Pure Water. If I drop Super Jump, he will make clone and it will break EXP route especially he eats Geno and of course, it huge time loss. I'm glad I didn't fail. Talk to Melody Star and then talk to Monstermama. Get Super Suit and Attack Scarf. +30 speed, +50 all status, blocks all bad status and elemental spell damage. +30 all status, blocks mortal brow. Back to Land's End and get Troopa Pin from Sky Troopa minigame. - They all are weak to ice. - They do counter attack by 1/3 chance. Bad damage roll, 1 counter and long enemy attack animation, it's not good but I got 1 Ice Bomb freebie. I got sharman encounter I should've jumped but I still had to chance to hit. I hate him. - Crack proceeds when his HP is below 400, 300, 200, 100. Egg will be broken less than 0. - Birdo starts using different egg attack when he is attacked 3 times or more. - B button defend can reflected this. Average fight, I could've killed without Bad Mushroom but it's rare. I could use Fire Bomb, I will use Bad Mushroom otherwise. Fire Bomb strat saves a turn. In old route, 4 turn kill is possible but not for this route due to lower level. (It's still possible but all good damage roll is required). Vallentina used spells every time except 1st, her battle phase didn't go well. No data because I'm lazy. Just do Geno Blast. - Czar is weak to ice. - Both do counter attack by 1/3 chance. - Zombone is weak to thunder and jump. Went really well, I was going to use Ultra Jump on Zombone if Geno couldn't attack twice. - Pink HP 400, is weak to fire, uses Petal Blast when 1 or more rangers are defeated. do counter attack when she is attacked by Special. - Black HP 550, is weak to thunder, moves twice, do counter attack when he is attacked by Special. - Red HP 800, is weak to ice, uses Vigor Up! when 2 or more rangers are defeated. - Yellow HP 600, is weak to jump, do counter attack when he is attacked by normal attack. - Rangers HP 999, is weak to thunder, do Breaker Beam once in every 2 turns. I could use both Ice and Fire Bombs, good. Ultra Jump RNG was bad though. I went back to Mario's Pad to perform RNG manipulation. RNG value is changing in every single frames except during loading or you're in overworld. Bowser's doors use this value, and it's initialized by reset. So if you reset the game after save and exit Mario's Pad as soon as possible you can, You'll get same value every time and can predict which doors are Battle. About 13 seconds slower than Nimbus Land but Pad manipulation is really easy and you can do it on English version too. No mistakes in Door part, It's perfect if I got KeroKeroCola freebie in Yaridvich. - He summons monster in 2 turns. He will summon again after you beat monster 2 turns later. Went normally, Willy WIsp has long animation though. - He has great Attack/Defend status when red, great M.Atk/M.Def when blue. In contrast, red has really weak M.Atk/M.Def and blue does weak Attack/Defend. He changes his body in 3 turns. - He will do counter attack by 1/3 chance. Good fight, no counter attack. - Left eye HP 300, is weak to fire and jump, has put bad status spells. - RIght eye HP 500, is weak to fire and jump, has attack spells. - Neosquid HP 800, has bad status/attack spells and normal attack. - Exor HP 1800, is invincible when both eyes are alive. Killing eye takes Exor's invincible off completely. So you can use Geno Whirl on him. - Count Down is weak to jump and thunder. - Ding-A-Ring is weak to thunder. - If you kill Count Down first, you'll get only 20 EXP and no coins. Fear Roulette on Peach is worst thing ever in this fight. I lost about 35 seconds here. - He will use Multiplier! since 2nd turns. He will be back to normal when you kill all of drill bits. I got Rock Candy, great. Using Shocker is slightly faster but you need perfect shocker timed attack. - Cloaker has low M.Def, Domino has low Def. - Snake status is depend on which enemy you killed in 1st phase. - 2nd fastest character moves 1st here. I don't know why. Super Jump on Earthlink is usually faster and safer than just attack on Mad Adder since link won't use spell. I drop Super Jump often here, It's good not to drop. - Clerk will do counter attack by 1/3 chance. - He will use Valor Up and Vigor Up! when both Mad Mallets are killed. Geno Blast and timed attack. Get a Rock Candy from Toad. - Manager summons when all Pounders are killed. Pounder did long animation move but perfect. - He will use Valor Up and Vigor Up! when all Poundette are killed. - He will summon Poundette when all of them are killed. - Gunyork is weak to ice and thunder. - He will do Breaker Beam in every even turns. I could spend multiple of Rock Candy and Ice Bombs. This is really great fight. I had to use shocker otherwise but it's long animation. - Smelter is weak to thunder. - He summons Shyper once per 2 turns until both shyper are alive. I didn't kill Smithy 1 with Super Jump for 2nd phase. Kill with Rock Candy is ideal. I got unnecessary Rock Candy freebie and did 1 unnecessary Super Jump. I missed Mario's damage output so I took safe bet. - Body can't do attacks when his HP is 0, He will reveive 3 turns later. Double 100 Super Jump is really good especially I was on new record pace, so much pressure. Peach and Geno were killed during Tank head but I got lucky head after this. I believe I only lost a few seconds due to being killed.